Robert Mix's Blog: Ameru's Big Week! Our previous best-ever week was on the order of $55,000. The single biggest reason for our huge week was the arrival of our KBC bearings, with LOTS of "carnecitas" ("small pieces of meat" = big selling items). The above is a big & heavy "Hub & Bearing Assembly" made by our second largest supplier, Iljin of Korea. In the above list, Codigo prefix starting with "02" are KBC (Korea), our biggest selling brand. "11" is Iljin (Korea), our second best selling brand. "13" is MBS (Japan), whom I also visited on my recent trip to Korea and Japan (see articles in May). "29" is ZWZ (China), there are many buyers of cheap Chinese bearings for trailer axles. "03" is some leftover Koyo (Japan) which we are not buying anymore. Compare the list above with the list of best selling bearings over a longer time period (biggest selling pieces only (over $30,000 total) from 2009 until present). The numbers under each year is quantity sold each year for that piece. Some differences, but you can see that the "Tico" bearings have been VERY important to our company. 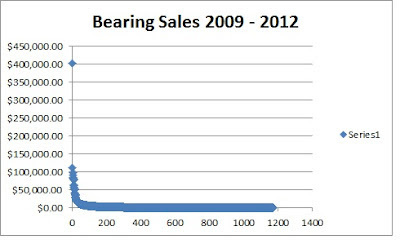 People who like NUMBERS might enjoy the below graph, it shows sales of all our bearings, piece by piece, same 2009 - 2012. If any of you, dear readers, knows how to do "curve fitting" I would like to know how to compare THIS graph (better said: distribution) compares with the exponential distribution. "CLICK on the image for a better view." 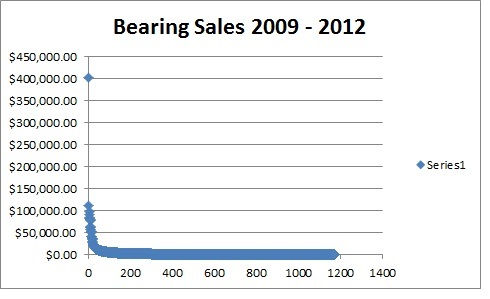 Note that I cut off the "tail" about 20% to reflect sales of bearings available all four years. This distribution is likely related to the famous "80/20 Rule", in that the top 20% of customers represent 80% of sales, also the top 20% selling PRODUCTS usually works the same (the top 20% represent 80% of sales). Ameru is more like "90/10" though. That does leave us vulnerable to changes. But, this does nothing to prevent me from thanking my in-laws in Peru for a job well done!